There’s a certain nobility to the small, furry creature, wrapped in a cape with a frilly ruff, a rice paddy farmer hat atop his head. He’s standing bravely on the edge of a grassy precipice, buffeted by a gust of wind so strong that his cape swirls backward and one tiny paw lifts off the ground. “It was only after the winds shifted that he understood himself able,” reads the letterpressed text beneath him. The black-and-white wood engraved image could be from a vintage children’s book; instead, it’s a very recent story print, a work of art in and of itself by Asheville artist Andy Farkas. 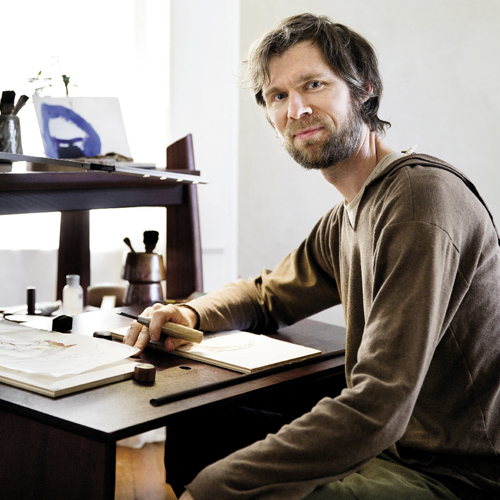 Farkas describes his work—wood engravings and moku hanga, a traditional Japanese woodblock technique—as storytelling. The story starts with a sketched image, usually an animal: a soulful squirrel, a contemplative fox, a bear nestled in the crook of a crescent moon. Animals, with all their sweetness and vulnerability, are easy to relate to and lack any prejudice that may exist with representations of people, says Farkas. He sketches an image spontaneously, then chooses his printmaking process. The limited line of letterpressed text that he adds reveals itself only after the image is complete, but the artist is careful “not to explain away” the visual with it, he says. “The text broadens the context of the image rather than narrowing it.” The story and text together are stronger than either would be on its own. Despite the association with fables that comes from the anthropomorphic characters, the stories aren’t moralistic, says Farkas. Rather, the story can be whatever the viewer takes from it. Farkas’ work was recently included in the Wood Engravers’ Network Triennial Exhibition 2014–2016, a traveling exhibit featuring work by 51 artists from Europe and the United States. “Farkas’s wood engravings and handset type pieces took my breath away at first view,” says exhibition juror Joan Boudreau, curator of the Graphic Arts Collection at the Smithsonian’s National Museum of American History. “His work combines endearment and imagination in such a magical way that the imagery seems to be describing traditional prose or poetry, such as Peter Pan or Stevenson’s ‘The Land of Counterpane.’” The Smithsonian recently purchased six of his works for its collection. Farkas recently taught a workshop about the creative process at the International Moku Hanga Conference in Japan. One of the key points, he says, is to follow through with the original inspiration. “I don’t ever censor myself,” he says. As a result, his prints have a singular quality that manages to capture moments and sentiments that are universal.